Our affordably priced men's hospitality industry collared shirts from Sharper Uniforms vary from casual men's collared shirts to elegantly designed men's tuxedo shirts with collars. For casual resort and restaurant settings, we have comfortable polo shirts and colorful short-sleeve tropical camp shirts for your wait staff and casual front desk crews. We have long-sleeved white dress shirts with no pockets, and collared shirts with pockets in solid or patterned styles. A good-looking shirt that lasts is an essential part of a waiter's uniform. 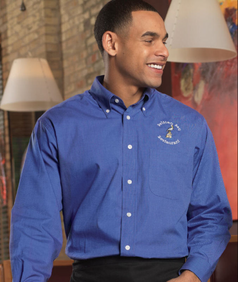 Our machine washable waiter uniform shirts resist stains and wrinkles. Many of our men's shirts come with a variety of sleeve choices, so you can find the shirts that will fit your staff, theme and comfort level in cool or warm temperatures. Unlike non-uniform shirts, these collared shirts are made from fabrics that can withstand long days on the job. Many of our affordably priced men's shirts are made from a premium poly/cotton blend that can stand up to daily wear and repeated laundering. Many collared shirts feature wrinkle-resistant, moisture-wicking and/or stain-release qualities. Sizes range up to 6XL. Shop our latest designs in men's microfiber uniform shirts and long-time favorites in smartly tailored men's security uniform shirts.